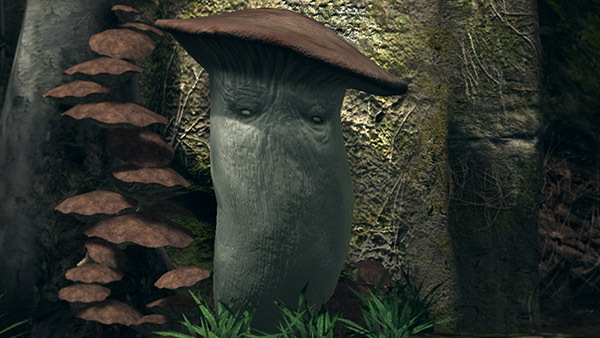 Elizabeth is a giant sentient mushroom who acts as Oolacile Sanctuary's keeper. She has no arms, making her distinct from the Mushroom Parents elsewhere. She is most likely Princess Dusk's caretaker when the princess was small. Elizabeth recognizes the player as the savior of Dusk in the future, then tasks the player to rescue Princess Dusk once more, as Knight Artorias seems to have failed his mission. If you have rescued Dusk of Oolacile but have not bought all of her spells, then Elizabeth will sell the remaining ones. 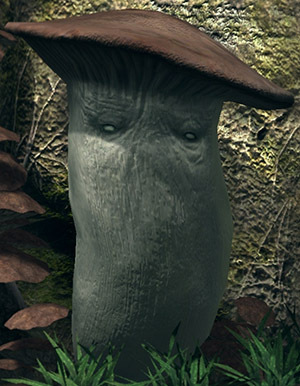 Gifts you Elizabeth's Mushroom x3 after you killed Manus, Father of the Abyss. If Dusk of Oolacile is dead (wherever and whenever you kill her), Elizabeth will be dead too the next time you visit her. Killing Elizabeth will not make Dusk hostile, you'll just lose a merchant. All dialogue text is © From Software Inc.
From what far-away age hast thou come? Thy Scent is very human, indeed. Thine aura is precisely as she described. I thank thee deeply, for rescuing Her Highness. …snatched away by that horrifying primeval human. Couldst thou once more play the saviour? I am Elizabeth, guardian of this sanctuary. Something of a godmother to Princess Dusk. I shall assist thee, to my utmost. For I am one with the sorceries of Oolacile. and are apt to blur our boundaries. I am ashamed to have been so imposing. But should thine heart be changed, speak to me again. This sanctuary, and the sorceries of Oolacile, are my domain. My strength could surely assist thee in thy travels. Speak to her after answering "No." Such that thou might rescue dear Dusk? Thou shalt see further on. and threatens to swallow the whole of Oolacile. but such a hero has nary a murmur of Dark. overcome by its utter blackness. May the flames guide thee. Thou art from a time far, far ahead. There are many things I wish to ask. But I know that I must not. The perils of our time are overwhelming enough. Hah hah…Was thine eye, glancing hither? Though needst not hide thy wonder. I am a mushroom, after all. Not long ago, I had another visitor. A human like thineself, from a far-away time. And I am afraid that he is still amongst us. Thank goodness thou art safe. What is they wish? I offer thee my all. Thou hast rescued Princess Dusk. …and rid us of that terrible primeval human. Even halting the spread of the Abyss! I salute the grandeur of thine enterprise. Please, allow me to express my gratitude. I thank thee…as do we all. I will remember thee, but I will keep thy story to myself. This is the best way, for thou art come from a time far ahead. No-one will sing they praises, but yet thy greatness shall live on. For it shall be my purpose, to remember all thou hast done for us.